Thanks to TLC Book Tours, we're pleased to present a review for White Out, a new memoir by Michael Clune. Make sure to check out the rest of the tour stops to see other reviews! 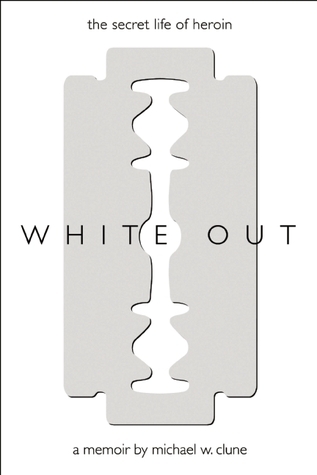 How do you describe an addiction in which the drug of choice creates a hole in your memory, a "white out," so that every time you use it is the first time--new, fascinating, and vivid? Michael W. Clune's original, edgy yet literary telling of his account of life inside the heroin underground reads like no other, as we enter the mind of the addict and navigate the world therein. After his descent into addiction, we go with him through detox, treatment, and finally into recovery as he returns to his childhood home. There his heroin-induced "white out" begins to fade. I've had somewhat of a life-long interest in issues surrounding addiction and recovery (I was only a few credits shy of getting a rehabilitation counselor certification in college, even), so I was pretty excited about reading Michael Clune's memoir, and it didn't disappoint. Although the story skips back and forth in time, the reader eventually gets to follow Clune down the path of his addiction -- from ripped-up houses and shady street corners to his first time trying heroin to being locked up in a Chicago jail. It can be a gutting story to read, watching Clune wrestle with his addiction, knowing exactly the ways in which he is hurting himself, but is unable to stop. Reading a true story from this perspective is fascinating in a morbid sort of way -- but knowing that Clune has been sober for at least 10 years at this point gives the book an optimistic ending. For a book published by a rehab center, we spend little time with Clune at or post-rehab. Most of the time is spent showing his slow spiral downwards from just being a casual user to being at a point where his addiction has really taken over his life. No one just stops using heroin, I can imagine, and Clune talks openly about the things that remind him of using, or that were triggers to make him think about using again. Clune writes with a very stream-of-consciousness style, which can sometimes be difficult to read and follow, but it is very effective at illustrating the thought patterns of an addict. It's a good writing style for the type of story that he's telling, but it may be off-putting for some readers. There's a lot of repetition, emphasis on certain symbols or signs, literary or cultural references, etc. that readers may want to skim but overall, I think the book is a worthwhile read, especially for anyone who may be dealing with the addiction of a friend or loved one.